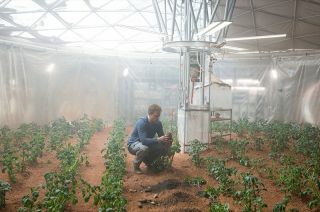 Astronaut Mark Watney (Matt Damon) has to grow food on Mars, a planet where nothing grows, in "The Martian." Ah, Mars. The place that dreams are made of. As long as those dreams involve a poisonous, tenuous atmosphere, inhospitable cold and lots and lots of red. Still, people seem to want to go there. But will we ever make it? "Yes," if you ask Elon Musk. I agree, but it probably won't be as easy as you might think, even if you think it's going to be really really hard. What's the problem? Pick up the nearest object and throw it. I don't care if there are people around you. Do it. This is an experiment. This is science. Note how far the object goes before it hits the ground. Now pick it up and throw it harder. It went further, didn't it? Part of the reason you didn't throw it as far as your ego thought you would was air resistance. Plowing through the atmosphere like a bull in a molecular china shop, the object quickly loses speed. But the actual "hitting the ground” part is due to gravity. If you took away all the air, your thrown object would still eventually hit the ground. In an airless world, no matter how hard you throw the object, it will reach the ground in the same amount of time. That's because gravity only works in the "down" direction, not the "over" direction, so for all gravity cares, you might as well have just lazily dropped it. But the harder you throw it, the more speed it will have, and the farther it will go before inevitably hitting the ground. Or maybe not so inevitably. Imagine throwing something so hard that in the few seconds before it hits the ground, it reached the other side of a house. Or maybe a street. Throw it harder and you could get it across town. Across the country. Even faster: across an ocean. Imagine throwing it so fast that by the time gravity gets around to doing its thing, the Earth has curved away from it. Gravity keeps on tugging at the object, but it frustratingly keeps missing the ground. How fast is orbital fast? Around 18,000 miles per hour (or 11 kilometers per second), give or take. There is, after all, an actual atmosphere to deal with. You can certainly go slower and still visit space. Just make sure you packed a heat shield, because you're coming back down. You can also go even faster than orbital speed and escape the jealous clutches of Earth's gravity altogether, which is what it takes to get to Mars. And that's the fundamental challenge. There just aren't many ways of pushing stuff that fast. Our best method so far involves blowing up stuff in a tube, and making sure to leave a hole in one side. Newton's laws do the rest. It seems primitive, but the engineers tell me these "rockets" are actually quite complicated. We can easily send robots to Mars, because their feelings don't get hurt if you forget to pack the oxygen and food. But people are a different … well, animal, altogether. Humans are heavy. Humans need to carry little bubbles of the Earth ecosystem with them everywhere they go. Humans need room to stretch. Humans want to bring human-centric niceties, like hammers and toothpaste and lima beans. Oh, yeah, and we need to bring them back home, I suppose. So pack the spare rockets and extra fuel. Let this sink in: at the time of this writing, we don't have the capacity to send humans beyond Low Earth Orbit, the very edge of space, let alone Mars. Getting to Mars is hard, folks, and it requires a lot of new technology. And that's just enough stuff for a handful of hominids to poke around the place for a bit. A colony? Look around the city you're in, and marvel at all the junk it takes to get you through the day. Think of all the layers of civilization and organization (spontaneous or otherwise) it takes to get you dinner. Made of food. Cooked. On a plate. That you will clean up with water … eventually. In a house. On a street. And on and on. A city is a massively complicated thing. Sure, we've built them from the ground up before, but colonies on Earth have a few advantages, namely, a) breathable air, b) liquid water, c) dirt and d) proximity to other Earth-based cities. Even the U.S. National Science Foundation's Amundsen-Scott South Pole Station — the closest to a Mars colony you can get while keeping two feet on the Earth — enjoys most of these advantages, and is still a nightmare to keep alive. But a two-year journey to Mars? Exposure on the surface? Better make sure your transports and habitats are well-shielded or buried underground — or at least make sure you have some talented oncologists on staff. Despite these challenges and more, it's not impossible to get people to Mars and start a viable colony. It's not like there's any physics-based reason preventing the escapades. It's just a question of engineering. And money. SpaceX has an ambitious plan to get a colony on Mars through private investment in ever-larger, cheap, reusable rockets that could deliver a steady stream of people and supplies to slowly build up a colony over decades. It just takes lots of money. NASA has an ambitious plan to build the Space Launch System, the biggest, most hard-core rocket ever made. With that kind of fire, you could send all sorts of stuff into space, including a crew to Mars. It just takes lots of money. There are other ideas, such as Mars One ("I know, just leave everybody there, then we don't have to pay for a return ticket!") and Mars Direct, but in the end it takes time. And lots of money. So eventually, we'll do it. Humans will go to Mars . Babies will be born there. Civilization will flourish — or flounder — on the Red Planet. It's just a matter of when, and of how much money we're willing to spend. Did I mention the money part? Sure, if one day everyone decided that we don't need socks anymore, we could use the leftover savings to fast-track a Martian colony. Full of chaffed feet, but a colony nonetheless. We're certainly at the civilizational stage where sending humans to Mars is feasible, which is a huge first step. A hundred years ago, not only did we lack the technology, but also the economic wherewithal to entertain such a wacky notion. That's the trick to getting to Mars: either we need to be so wealthy as a society that a trip is so economically insignificant that nobody cares, or there needs to be a large political (if led by NASA) or economic (if led by a company) incentive to do it. One or both of those scenarios is bound to happen, sooner or later. Learn more by listening to the episode "Will we colonize Mars?" on the Ask A Spaceman podcast, available on iTunes and on the Web at http://www.askaspaceman.com. Thanks to Ann Fisher for the question that led to this episode! Ask your own question on Twitter using #AskASpaceman or by following Paul @PaulMattSutter and facebook.com/PaulMattSutter.